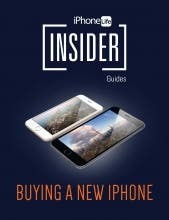 The following is one of iPhone Life Insider's in-depth guides. 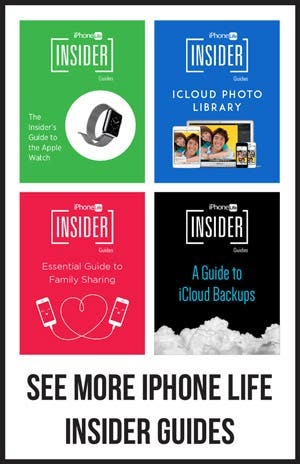 To access all our guides and premium content, sign up for a subscription to iPhone Life Insider. Buying the new iPhone 7? When it comes time to switch iPhones, the process can feel daunting. While you’re excited to use the new features of the iPhone 7, there’s selling your old iPhone, setting up your new iPhone, and restoring the data from that old iPhone onto the shiny new iPhone 7. You’ll also want to find the best deal on the iPhone 7 and a great carrier to go along with it. Leave your worries at the top of this page. We’ll go through everything you need to know to make switching iPhones and setting up your new iPhone a smooth transition. We’ll cover how to transfer data to the new iPhone, how to prepare to sell your old iPhone, how to restore your iPhone backup, buying a new iPhone 7, selling or trading in your old iPhone, and whether or not that extended warranty or insurance is worth the extra money. Let’s dive in; here’s how to set up your new iPhone 7 the right way. If you’re concerned about how to transfer photos from iPhone to iPhone—don’t be. Whether you’re looking to transfer pictures, contacts, music, or other data from your old iPhone to your new iPhone, an iPhone backup will cover it all. When you create a backup of your old iPhone, everything from your settings, iTunes and App Store purchases, app data, text messages, voicemails, and Health and Homekit data will be easily transferred to your new iPhone 7. So when you go to switch iPhones, it’s a simple matter of restoring your new iPhone using a backup from the old iPhone. We’ll cover how to restore your iPhone backup below, but first let’s make an iCloud backup so everything you need to restore your new iPhone is ready to go. There are two ways to back up your iPhone: 1) over the air via iCloud or 2) by connecting your device to your computer and using the iTunes software. We’ll focus on iCloud here, but if you’d prefer to use iTunes, click the link to check out our full tip on how to back up your iPhone to iTunes on your computer. You’ll see a list of apps you use including Mail, Contacts, Safari, Notes, and more. Toggle all of them on. Open the Settings app on your old iPhone. Turn on iCloud Backup if it’s not already on. When iCloud Backup is turned on, a new option appears: Back Up Now, which allows you to back up immediately as long as you’re connected to Wi-Fi. 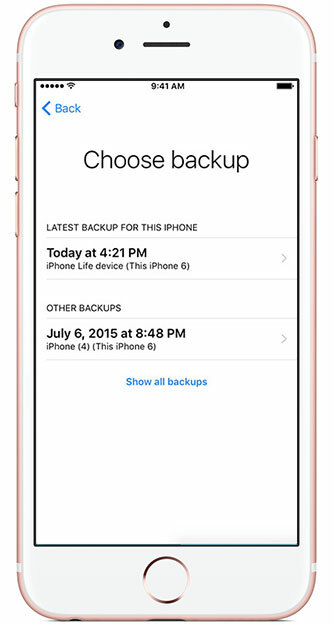 Under Back Up Now, you’ll be able to see when your most recent backup took place. Tap Back Up Now to start a new backup. If you want to be extra secure before erasing your old iPhone, we recommend making an iTunes backup on your computer too. Visit our tip on how to back up your iPhone to iTunes on your computer to do this, and check out the tip on how to encrypt your iTunes backup as well. Before you erase your old phone, we strongly recommend that you back up your data. Turn the device on. A setup assistant will appear that asks your language and country, if you’d like to enable Location Services, and which Wi-Fi network to connect to. A new screen will appear that says Apps & Data. From the three options, select Restore from iCloud Backup. Tap Next, and enter your Apple ID and password. You’ll then see a list of your recent backups.Choose the most recent, and tap Restore. As you restore your backup, you’ll need to enter passwords for your Apple ID, email, and other accounts. connect your new iPhone to your computer with a Lightning-to-USB cable. Once you’ve booted up iTunes, an icon for your iPhone will appear in the upper left menu. Clicking the icon will bring up a new window with options for syncing. Once your new iPhone is up and running, it’s time to start thinking about selling your old phone. Options include trading it in when purchasing your new one, selling it to a service that purchases used phones, or selling it on eBay. But first you’ll want to clear the data from it by resetting your iPhone to factory settings. Tap Sign Out. Confirm that you’d like to Sign Out. 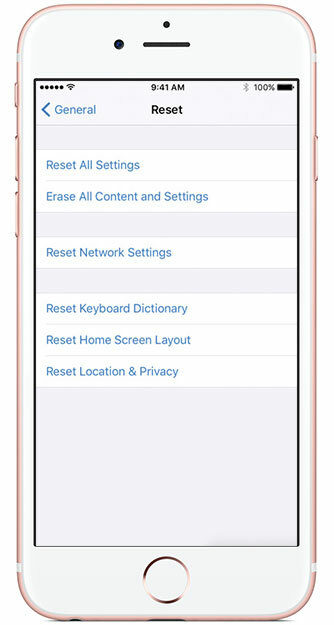 Tap Delete from My iPhone and enter your password to wipe your iCloud data from the phone. Next, in the Settings app, tap General. At the bottom, select Reset. If you’re asked for a passcode, enter it and tap Erase. This will remove everything from your iPhone, but all of your backed up content will still be available in iCloud. Click All Devices and select your iPhone. Click Erase iPhone. Once it’s been erased, click Remove from Account. You can take your iPhone to an Apple Store and get immediate credit toward the purchase of a new device. Or you can trade it in via Apple’s Reuse and Recycling website where you can get an online estimate of its value. Simply mail it in and you will receive an Apple Store Gift Card in return. Amazon also has a trade-in service in exchange for an Amazon Gift Card. This is an easy and convenient way to go if you’re already planning on buying a new device from Apple. However, you won’t fetch the highest price for your device. For instance, Apple offered $225 for a 16 GB iPhone 6 in perfect condition at time of writing, whereas you can get between $300–$600 by selling it on eBay. There are numerous websites that are eager to purchase your old iPhone, and Gazelle is arguably the best. The advantage of these sites over Apple or Amazon is that you get cash instead of an Apple Gift Card. Gazelle has a reputation for paying quickly and making the process easy, and will even wipe your data from your device before reselling it. The process entails getting an online estimate and sending in your phone. Gazelle then inspects it and, if it matches your description, Gazelle will issue your payment. At time of writing, Gazelle offered $220 for a 16GB iPhone 6 in excellent condition that's unlocked. uSell works a bit differently: It connects you with its network of buyers and lets you select the best offer. The process is similar to Gazelle, except that in this case the buyer, not uSell, will inspect your phone and issue the payment. While an eBay sale may be less convenient—and more risky—than the other services, you’ll likely get the highest price for your device. While an eBay sale may be less convenient—and more risky—than the other services, you’ll likely get the highest price for your device. It will work best, though, if you already have some experience selling on eBay so that potential buyers can see your track record. Once you’ve logged in, click Sell along the top menu, enter the model of your device, and you’ll be taken through a series of questions regarding the phone’s carrier, storage capacity, and physical condition. Then you’ll be able to choose whether you want to sell using auction style or fixed price. If you go with auction, the site will suggest a good starting price that will attract bidders. You can also add a ‘Buy It Now’ price (which you can set at a higher price) to allow interested parties to bypass the bidding process. 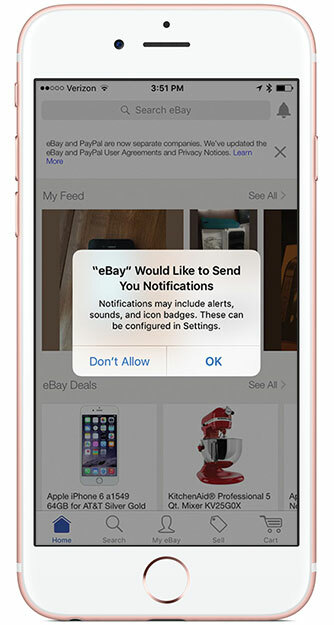 Your phone will be listed for a week, and if you download the eBay app (free), you’ll get notifications each time someone bids on your device. You can link a PayPal account to the app so you can receive payment once the bidding is complete. Make sure not to ship the phone until the buyer pays you. It's also good to note that eBay will deduct 10 percent of the final sale price. If the winning bidder doesn’t pay you in a timely manner, you can offer the phone to the next highest bidder using eBay’s Second Chance Offer. In the app, navigate to the Activity tab under My eBay and select Second Chance Offer, which will be an option for 60 days after the bidding ends. You’ll be able to offer one of your bidders the phone for the price of their highest bid, and you can choose how long you want your offer to last (up to 7 days). For more information, read our guide to selling your iPhone on eBay. If your iPhone has been under contract with a particular provider, it is typically locked, meaning you can’t use it with other carriers. If you’re selling your iPhone directly to someone, such as on eBay or via a classified ad, you’ll get a better price if you unlock it. That way, the buyer can use a compatible provider of his or her choice. Generally carriers will unlock your iPhone if you’ve completed your contract. If you have a prepaid iPhone plan, they’ll unlock it after one year. You can call your carrier and ask them to unlock it, or often you can fill out a form on your carrier’s website. In the last two years, all the major carriers have moved away from subsidizing phones. This is due to the pricing war T-Mobile started. Buying a new iPhone has gotten a lot more complicated in recent years. Not only do you need to choose which model of iPhone you want, but you also have to decide which of the many cellular plans is the best deal for you. Carriers are now abandoning the practice of offering a subsidized phone with a two-year contract in favor of selling iPhones separately. Consumers can now take advantage of payment plans and leasing programs to buy their new iPhones. Even Apple is getting in the game with its iPhone Upgrade Program. Buying your iPhone separately is better for most consumers because you can modify your plan, leave the carrier, or get a different phone without the penalties associated with two-year contracts. 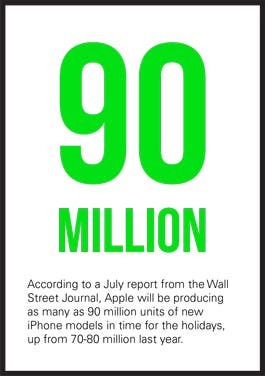 In the past, all the major carriers offered new iPhones for $199 as long as you signed a two-year contract with them. But starting two years ago with T-Mobile and ending most recently with Sprint, all the major carriers have moved away from subsidizing phones. Instead, the carriers now structure their plans around data. While you can pay the full price for your phones upfront, T-Mobile and Sprint let you lease your phone and Verizon and AT&T let you finance it by paying monthly installments, which aren’t included in the price of the plan. Without a contract, you’re no longer locked in for two years, meaning you can cancel or modify your plan at any time. Before getting into cellular plans, you may be able to simplify your search by first considering carrier coverage quality. T-Mobile and Sprint do not have great coverage in many rural areas. So even if the deals they offer are tempting, you may want to look at a coverage map on the carrier website first. Note: All of the following plans come with unlimited talk and text. Cellular Data is still what you pay dearly for—that’s what lets you surf the Internet, listen to music, and watch movies even when you’re not connected to a Wi-Fi network. Data: Verizon’s new plan structure comes in five sizes, all with unlimited talk and text: $35 for 2GB of data, $50 for 4GB, $70 for 8GB + 2GB/line, $90 for 16GB + 2GB/line, and $110 for 24GB + 2GB/line. Access fees: You’ll also pay $20 per month for your smartphone access fee or $10 to connect a tablet. If you’re currently under contract with Verizon, you will have the option to keep your current plan if you choose. While Verizon has dropped subsidies, you can pay for an iPhone in installments if you want to. If you cancel your plan or upgrade to a newer model, you must pay for the rest of your phone if you’re on a payment plan. You can share your data across as many devices as you like. You’ll just have to pay an additional $20 per month for each smartphone you add but you'll also get an additional 2GB of data per line. Sprint has jumped on the no-contract bandwagon as well with its iPhone Forever leasing program, which lets you lease an iPhone starting at $16 a month for the iPhone SE. Data: Sprint offers plans XS-XXL and an Unlimited plan as well. The XS plan gets you 1GB of data for $20 a month. For $30 it's 3GB, for 6GB it's $45, for 12GB it's $60, for 24GB it's $80, for 40GB it's $100. You can also get Sprint's unlimited data plan for $75 a month for the first line. Access Fees: Sprint's access fee is $45 a month for the XS-XXL plans and $25 for the unlimited data plan. Sprint has multiple family sharing plans. For $45 the family will share 6GB, for $60 it's 12GB, for $80 it's 24GB, and for $100 it's 40GB—same as the single line data plan prices. There will be an additional access fee ranging from $10-$45 a month per line. Many of these new options may not be available if you purchase your phone directly from Apple, either in-store or online. As mentioned earlier, T-Mobile doesn’t subsidize its phones, meaning you have to pay the full retail price or lease your phone for $20-$30 extra per month. T-Mobile is offering a Smart Fit plan right now that allows you to use your phone for 30 days—T-Mobile will then see how much data you used and reccomend a plan. Data: With T-Mobile, options range from $50 for 2GB of data up to $95 for unlimited data. Access Fees: T-Mobile markets itself on its straightforward pay structure. To avoid hidden costs, T-Mobile has done away with monthly access fees altogether. T-Mobile is unique in that all its plans cover not only the U.S. but Mexico and Canada as well, and that music streaming doesn’t count against your data allowance. For family plans, you can get up to 4 lines with 6GB each at $30 per line. AT&T lets you pay for your device in monthly installments and upgrade each year at no extra charge. Data: For 2 GB per month, AT&T charges you $30 month. You can get up to 50GB a month for $375. Access Fees: The fee will range from $15-$45 a month depending on your plan. Family: AT&T lets you share 15 GB between as many as 10 devices for $100/month plus $15 per line. Be sure to check out big-box retailers such as Walmart. Last year Walmart had one of the best options, financing a Straight Talk iPhone for $25 per month with zero interest. The Straight Talk plan costs just $45 per month for unlimited minutes, texts, and data (though the data speed is throttled after you reach 2.5 GB/month). If you buy an unlocked iPhone at cost from Apple, you can also use Straight Talk. If you plan to keep the same phone for many years and not upgrade with each release, this is one of the best options for saving money in the long run. 5) Extended Warranty or Insurance—Is It Worth It? Once you’ve selected a particular model and carrier, you’ll still need to decide whether to buy an extended warranty or insurance. Your iPhone comes with AppleCare, which entitles you to 90 days of phone support and one year of protection against defects. But some people want more protection than that, such as for accidental damage. A good first step is to check what warranty protection your credit card offers. Most credit cards will extend the warranty on electronics products for a year, and some even cover theft or losing your iPhone. That may be all you’ll need. Another option is AppleCare+. At a cost of $129 for the iPhone 7 and 7 Plus and $99 for earlier models of iPhone, it extends your warranty to two years and gives you two years of phone support. Plus, if you break your phone, drop it in water, or otherwise damage it accidentally, you’ll be able to get it repaired or replaced for $79. (Though you’re limited to two such incidents.) AppleCare+ does not cover theft or losing your phone. Another option is the insurance plans offered by the carriers and big-box retailers. However, experts tend to suggest that these offerings are expensive and not your best choice. Another option is to buy a warranty from a third-party insurer that specializes in electronics. SquareTrade, one of the largest third-party insurers, offers a plan similar to AppleCare+. For $149, you get coverage for two years and up to four instances of accidental damage at $99 each (compared to Apple’s two). Like AppleCare+, it doesn’t cover theft or losing your iPhone. It also reimburses you for Genius Bar appointments or other local repairs, and offers next-day replacements. In every case, you’ll typically need to buy your extended warranty or insurance within 30–60 days of purchasing your iPhone. By following these guidelines, you can take each step of the process of transferring to a new phone into your own hands—and make the most money doing it!